According to the American Bankruptcy Institute, the number of personal bankruptcy filings by Americans of all ages peaked at 1.5 million in 2010, the highest level since 2005, when the Bankruptcy Abuse Prevention and Consumer Protection Act made it more difficult to have debt forgiven. Filings declined to about 935,000 by 2014. The Institute for Financial Literacy reports that older people are making up an increasing proportion of bankruptcy filers. The over-65 group made up 8.3 percent of all filers in 2009, or about 99,600, a rise from 7.8 percent in 2006. 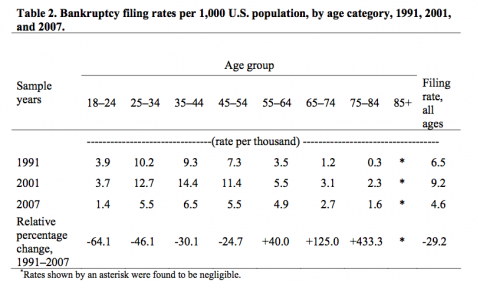 Most bankruptcy filers were employed when they filed, but about 10% were retired. Retirement research suggests that retirees can set up their spending and asset allocation to limit their “probability of ruin” to about 5% or so, but that is only the probability that he or she will deplete a savings portfolio as a result of market volatility and sequence of returns risk. Actually, there are several reasons a retiree might go broke. Respondents could choose more than one reason, so the total exceeds 100%. The “retirement” reason includes both unplanned and unwanted retirement (another form of unemployment), and bankrupt retirees who believed they had adequate financial resources to retire but discovered they did not. It is conceivable that some number of the filers who cited “retirement” as a cause for their bankruptcy succumbed to sequence of returns risk, though that data is not directly available. However, probability of ruin models show that portfolios are rarely depleted in less than 15 to 20 years for reasonable withdrawal rates, or until a 65-year old retiree is 80 to 85 years old. Research shows that bankruptcy filings decline significantly beginning at age 65 and the bankruptcy filing rate for age 85 and older is negligible. About 40% of elder bankruptcies are filed between ages 65 and 74. The fact that portfolio ruin is much more likely at older ages after bankruptcy rates actually decline suggests that sequence risk is probably not a large portion of this 6.7% of bankruptcy filings. In other words, most bankruptcy filers in the study were too young to have depleted their portfolios as a result of a poor sequence of market returns. 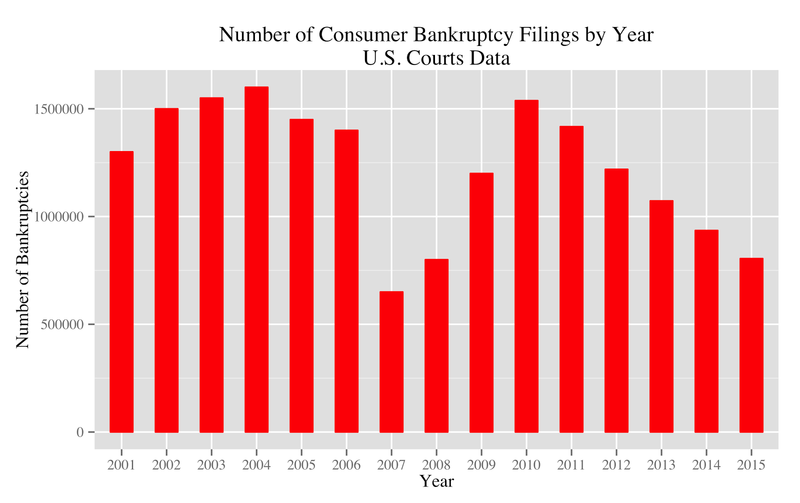 Note that there is no category of reports of bankruptcies due to market losses or sequence of returns risk, so if this reason for bankruptcy were cited by any filers it wasn't in the top ten. One might reasonably expect “Income Problems (41%)” to include loss of income from assets, but a closer read of Thorne (2010) shows this category refers to unemployment issues and not loss of income generated from savings. According to Thorne (2010), the probability of an American over age 65 filing bankruptcy is less than half a percent (about 0.43%), an order of magnitude less than the probability of ruin studies predict for premature portfolio depletion. The causes of bankruptcy are predominantly an unexpected increase in expenses, an unexpected loss of income or, more often, a combination of the two. I will refer to the risk of bankruptcy from either lost income or unexpected expenses as spending risk, combining the two because the net result is the same whether we have too much expense or too little income, and a crises will often include both. Most retirement income research doesn’t address either disruptions due to large unexpected expenses or those due to loss of income, focusing primarily instead on the risk of outliving one’s savings resulting from disappointing market returns and poor sequences of returns. I will refer to the latter as earnings risk, or the risk that portfolio returns don't ultimately support the chosen spending rate. 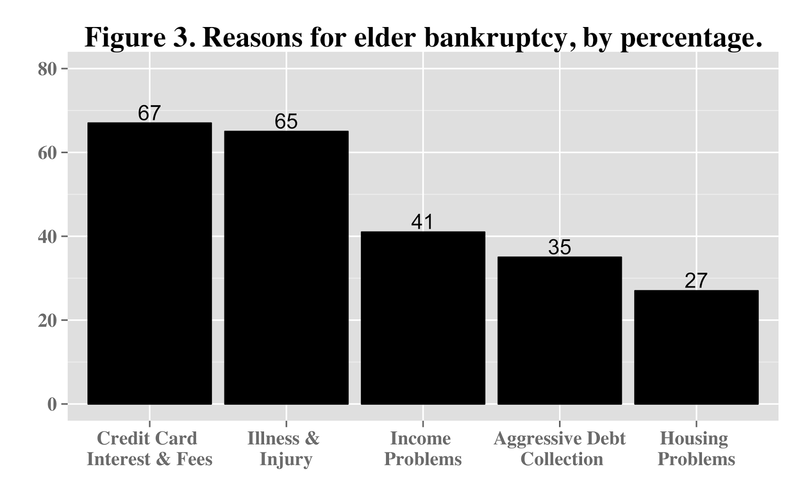 Dr. Thorne goes out of her way to note that the reasons elder Americans file consumer bankruptcy are interconnected, including the term parenthetically in the study’s title. As I argued in two recent blog posts, Positive Feedback Loops: The Other Roads to Ruin and Retirement Income and Chaos Theory, I believe the causes are more than simply interconnected.